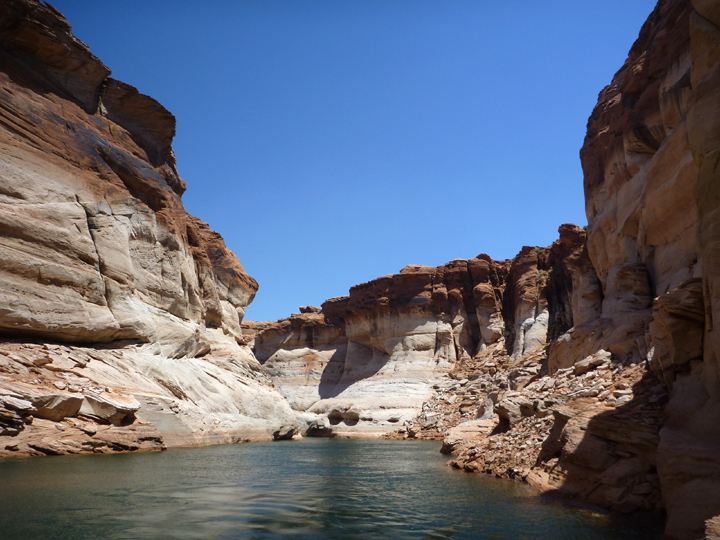 We spent a few days in the Page, Arizona/Lake Powell area on our way to Panguitch, Utah to get some 80,000 mile maintenance work done on haRVy. We didn’t expect to need to do this so soon, but we’ve put on 11,000 (!) miles since leaving Rhode Island in early October so it’s time. 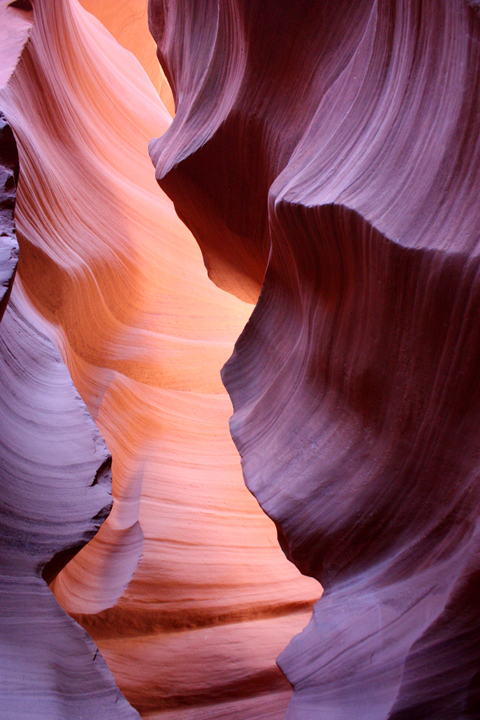 As avid photographers, a visit to Antelope Canyon was high on our “To Do” list and it did not disappoint. 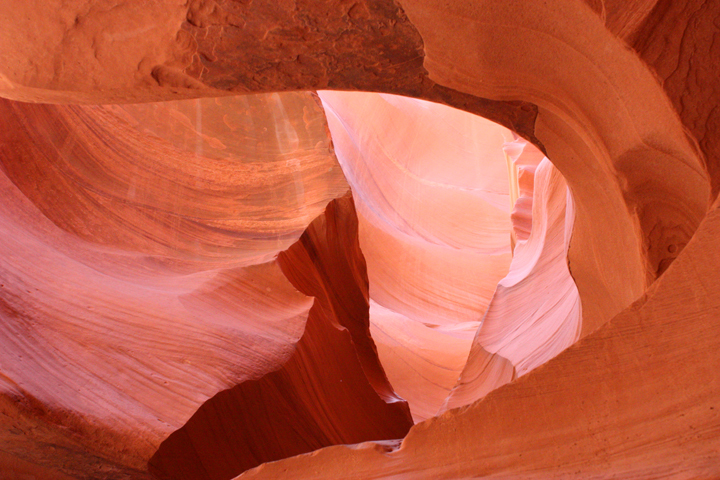 The canyon is the most-visited and most-photographed in the American Southwest. 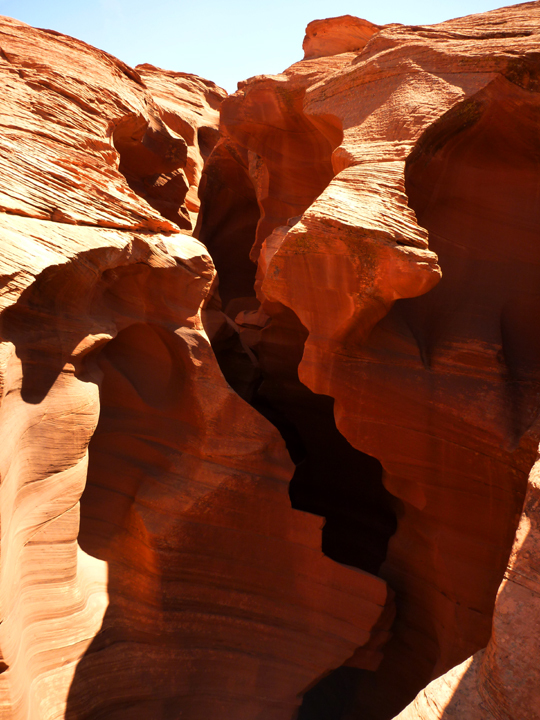 There are several tour options available and we chose a guided walking tour of the slightly less visited Lower Antelope Canyon. The entrance is via a steep stairway down into this narrow opening. 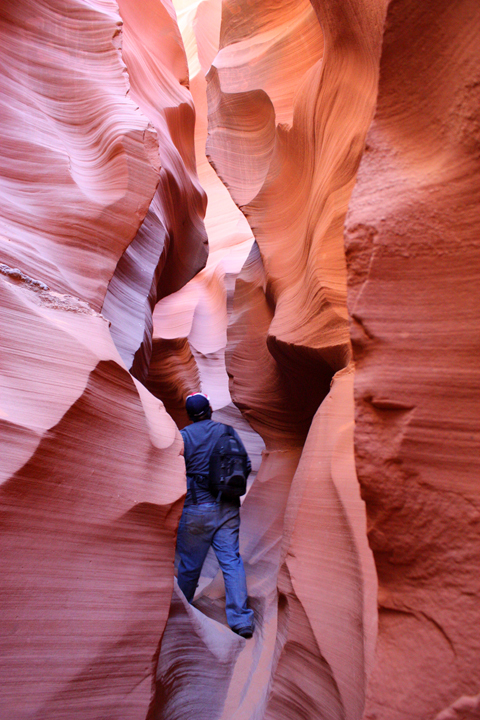 Our knowledgeable Navajo guide leads us through the narrow slot canyon. The light and colors are amazing. 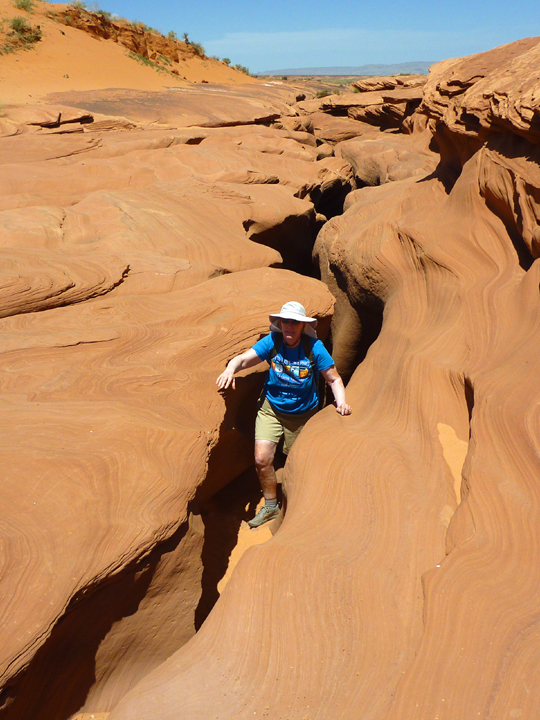 Climbing out the exit at the opposite end. 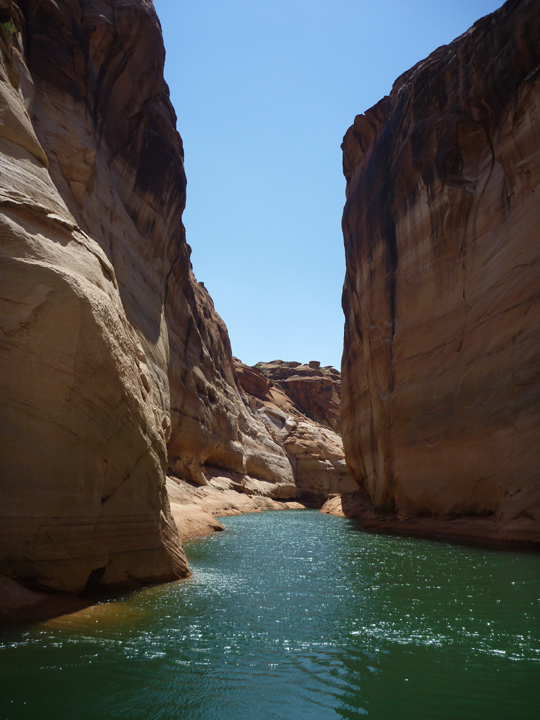 We just couldn’t leave the area without getting out onto Lake Powell, so the next day we took a boat ride into the section of Antelope Canyon that was flooded when they built the Glen Canyon Dam that created the lake back in the 50’s. 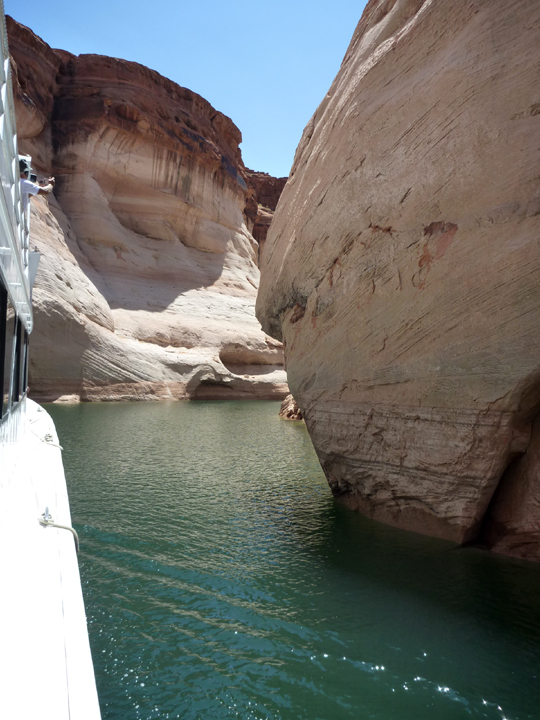 Turning into Antelope Canyon from Lake Powell. We were told that the “beach” is just beyond here where our boat had to turn around. 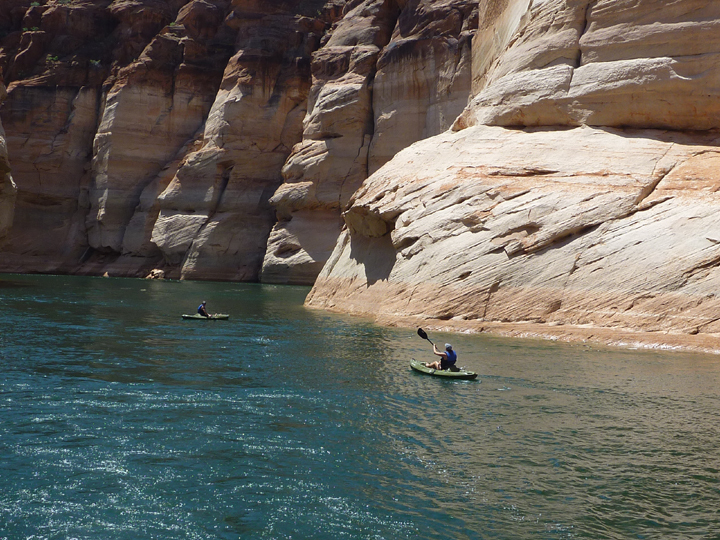 These kayakers lend scale to the landscape. We spent one night here at Lone Rock beach. 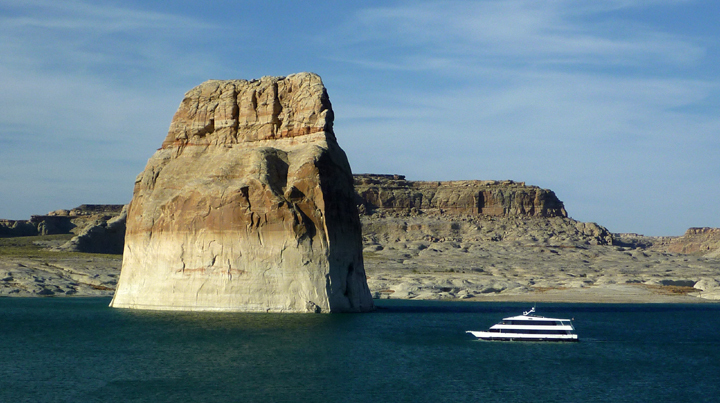 That tour boat is about 80-feet long, so that rock is HUGE. 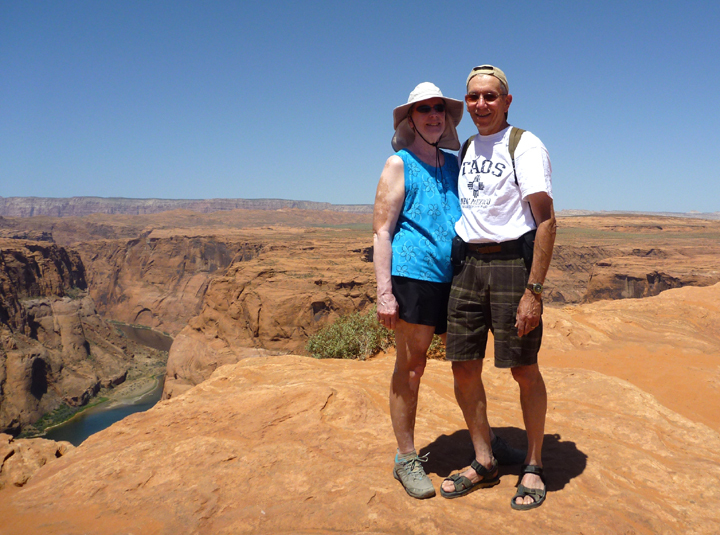 We also hiked out for a look at Horseshoe Bend on the Colorado River just below the dam. See ya next time from beautiful downtown Panguitch! 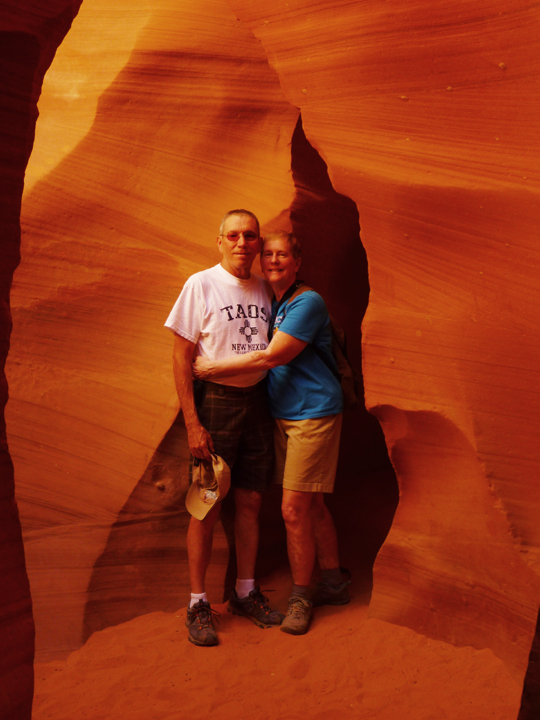 Cannot remember ever seeing photos of this amazing canyon…love the ones of you two together. I’m going to be really bummed when you return home. This has been the most wonderful vicarious vacation I have ever had! Glad you’re enjoying it! 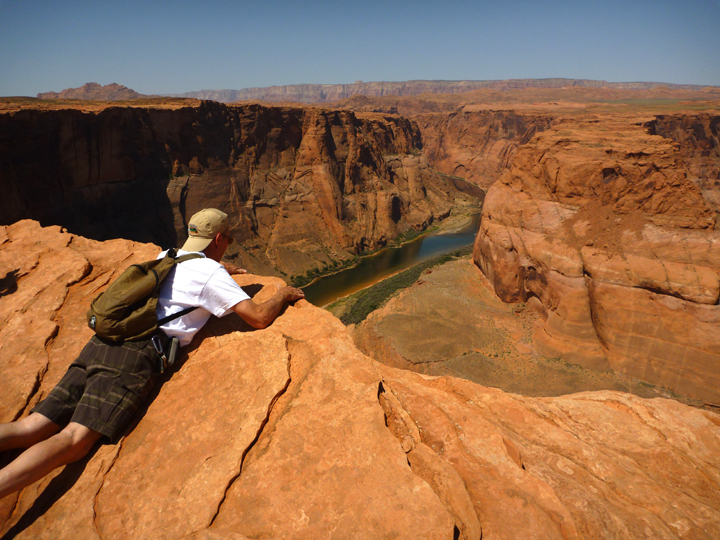 We don’t plan to go home anytime soon, so you should be able to continue traveling with us for quite a while longer. 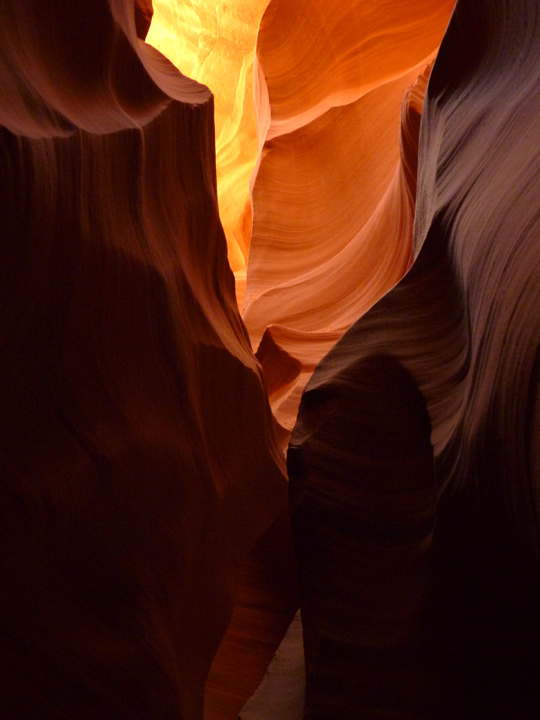 Your best photos yet. Beware flash downpours upstream, huh? Glad we get to continue on your travels. 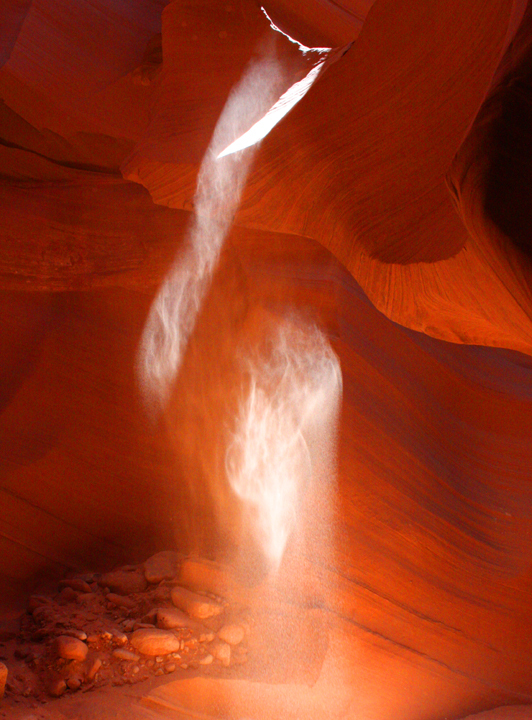 The Antelope Canyon pics are surreal. 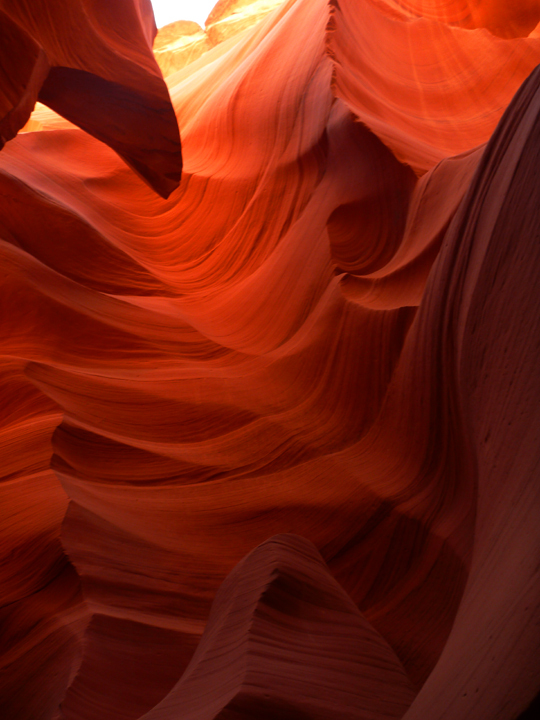 Some look like a diaphanous fabric, not rock. Have seen other pics here and wondered about this place. Way cool. Thanks. 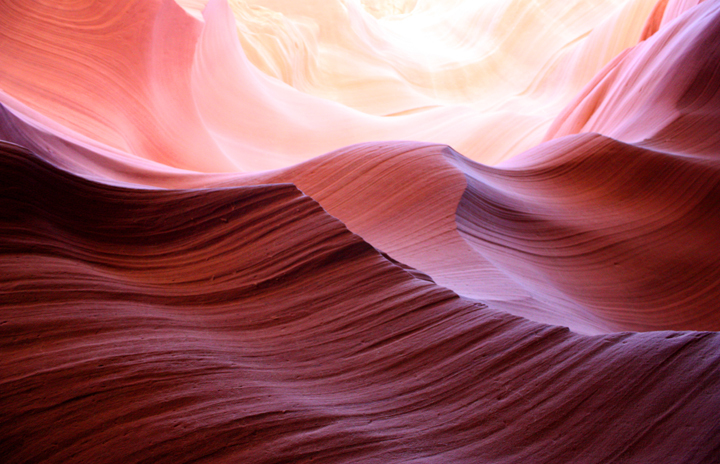 Beautiful world we live in ! 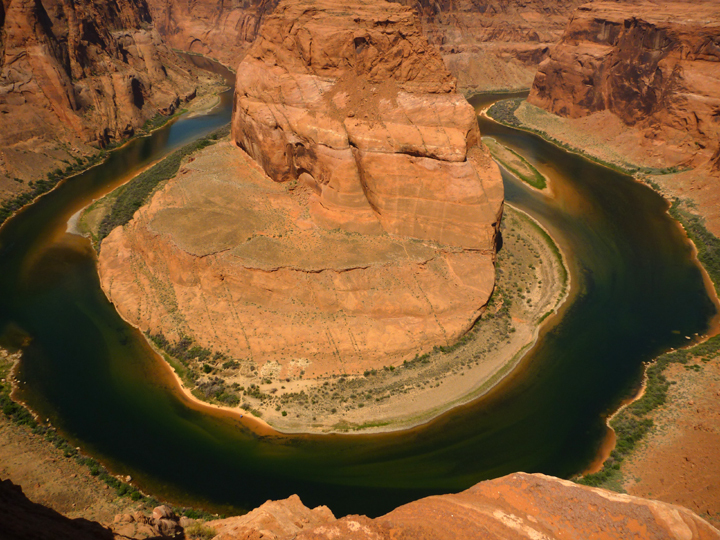 Once you get away from the Interstate Highways and cities it certainly is.